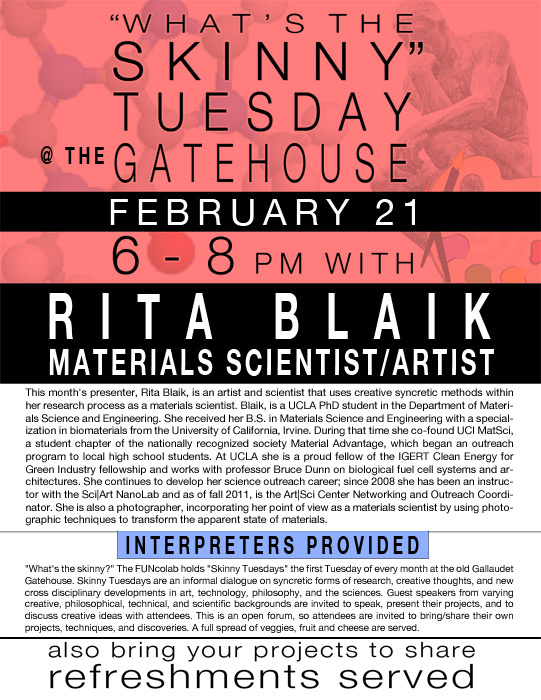 The next Skinny Tuesday talk at the Gallaudet Gatehouse, aka FUNCOLAB, will be on February 21, 6-8 p.m., and feature RITA BLAIK, an artist and scientist that uses creative syncretic methods within her research process as a materials scientist. 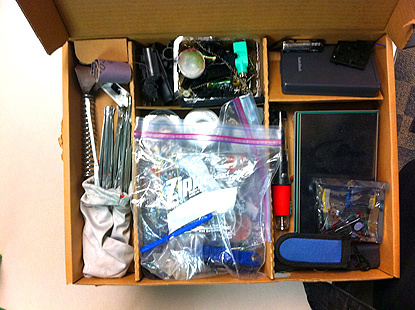 Blaik, is a UCLA PhD student in the Department of Materials Science and Engineering. She received her B.S. in Materials Science and Engineering with a specialization in biomaterials from the University of California, Irvine. During that time she co-found UCI MatSci, a student chapter of the nationally recognized society Material Advantage, which began an outreach program to local high school students. At UCLA she is a proud fellow of the IGERT Clean Energy for Green Industry fellowship and works with professor Bruce Dunn on biological fuel cell systems and architectures. 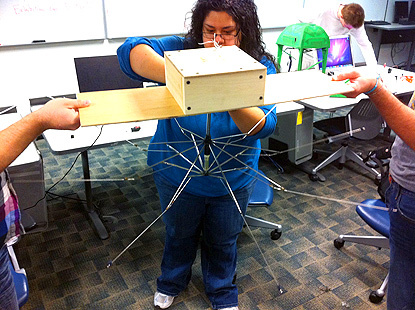 She continues to develop her science outreach career; since 2008 she has been an instructor with the Sci|Art NanoLab and as of fall 2011, is the Art|Sci Center Networking and Outreach Coordinator. She is also a photographer, incorporating her point of view as a materials scientist by using photographic techniques to transform the apparent state of materials. "What's the skinny?" 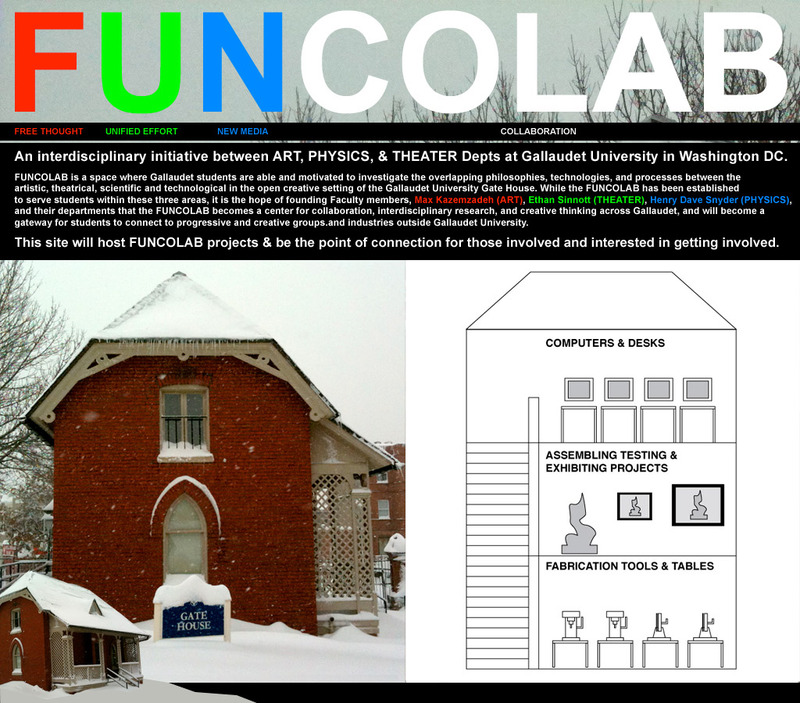 The FUNcolab holds "Skinny Tuesdays" the first Tuesday of every month at the old Gallaudet Gatehouse. Skinny Tuesdays are an informal dialogue on syncretic forms of research, creative thoughts, and new cross disciplinary developments in art, technology, philosophy, and the sciences. Guest speakers from varying creative, philosophical, technical, and scientific backgrounds are invited to speak, present their projects, and to discuss creative ideas with attendees. 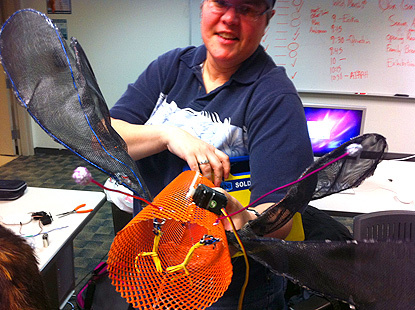 This is an open forum, so attendees are invited to bring/share their own projects, techniques, and discoveries. A full spread of veggies, fruit and cheese are served. 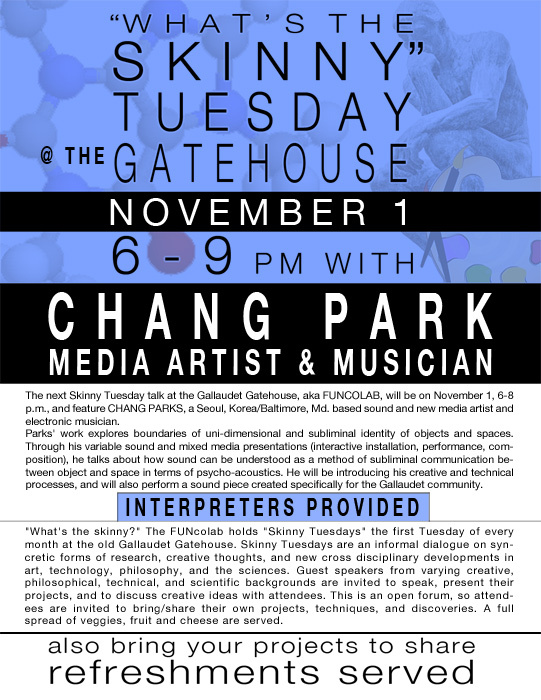 The next Skinny Tuesday talk at the Gallaudet Gatehouse, aka FUNCOLAB, will be on November 1, 6-8 p.m., and feature CHANG PARKS, a Seoul, Korea/Baltimore, Md. 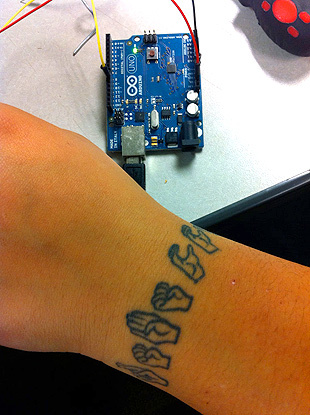 based sound and new media artist and electronic musician. 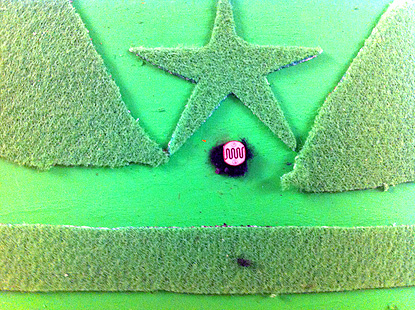 Parks' work explores boundaries of uni-dimensional and subliminal identity of objects and spaces. 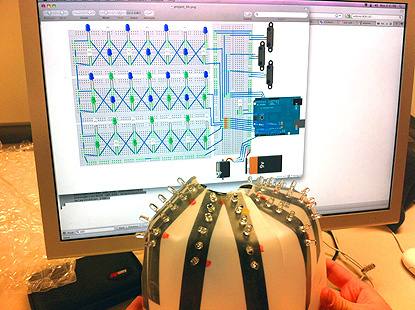 Through his variable sound and mixed media presentations (interactive installation, performance, composition), he talks about how sound can be understood as a method of subliminal communication between object and space in terms of psycho-acoustics. 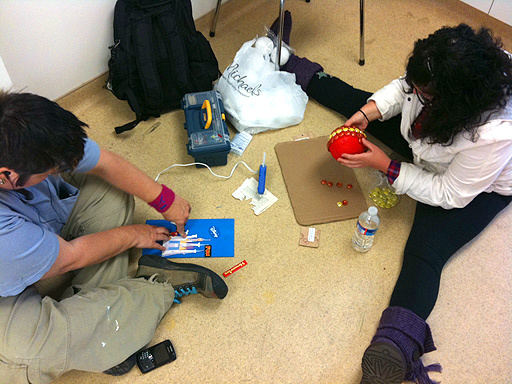 He will be introducing his creative and technical processes, and will also perform a sound piece created specifically for the Gallaudet community. 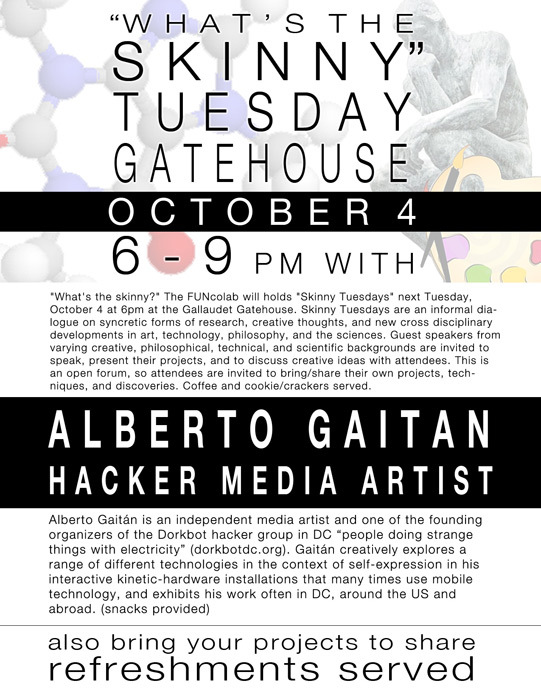 Alberto Gaitán is an independent media artist and one of the founding organizers of the Dorkbot hacker group in D.C., "people doing strange things with electricity." 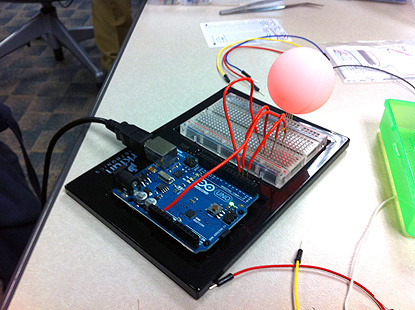 Gaitán creatively explores a range of technologies in the context of self-expression in his interactive kinetic hardware installations that many times use mobile technology, and exhibits his work often in D.C., around the U.S., and abroad. "Skinny Tuesday" is an informal dialogue on syncretic forms of research, creative thought, and new cross-disciplinary developments in art, technology, philosophy, and the sciences. Guest speakers from varying creative, philosophical, technical, and scientific backgrounds are invited to speak, present their projects, and discuss creative ideas with attendees. This is an open forum, so attendees are invited to bring/share their own projects, techniques, and discoveries. 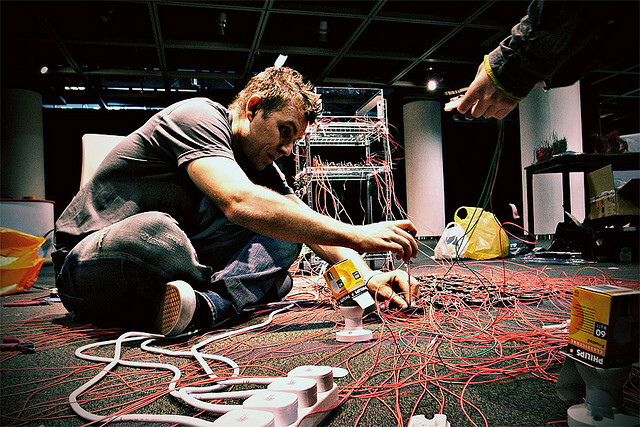 September 13th, 2011 (2nd Tuesday this month) 6pm: Speaker: Max Kazemzadeh is an electronic media artist, Assistant Professor of Art & Media Technology here at Gallaudet University and pursuing a PhD in the Planetary Collegium at the University of Plymouth in the UK. His research investigates the connection between the mind and perception as it relates to creativity, and will more specifically be talking about his most recent research of Apophenia and it's relationship to computer vision/face-recognition technologies as models for representing how we see and process visual information. Kazemzadeh will also be speaking about a number of his projects implemented this summer at international institutes for the art & technology that invited him to develop works onsite in China and Spain that are great venues for interested Gallaudet students explore creative opportunities. Contact max.kazemzadeh@gallaudet.edu with any questions regarding the event. <<< April 5th, 2011: Guest speaker: JD Talasek is an Artist, Writer, Curator, Director of the CPNAS (Cultural Programs of the National Academy of Sciences) and organizing DASERs events in DC, and is currently on the faculty in the Museum Studies Department at Johns Hopkins University. invited to speak, present their projects, and to discuss creative ideas with attendees. This is an open forum, so attendees are invited to bring/share their own projects, techniques, and discoveries. Coffee and cookie/crackers served. <<< To the left is an image taken from the top floor computer lab in the Gatehouse. 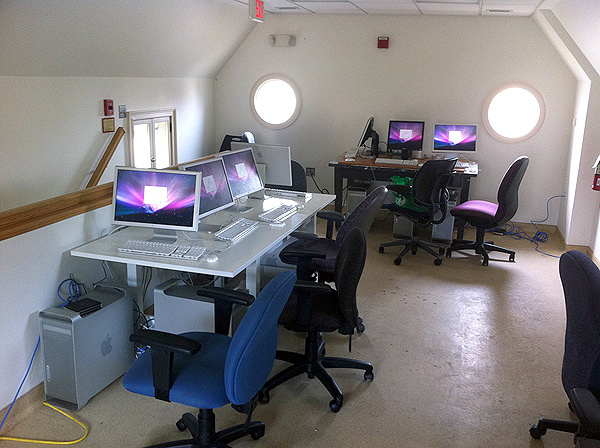 The lap is networked with 12 Macintosh G5 computers and is used for developing the digital, animated, and coded components within individual and cross-disciplinary projects. 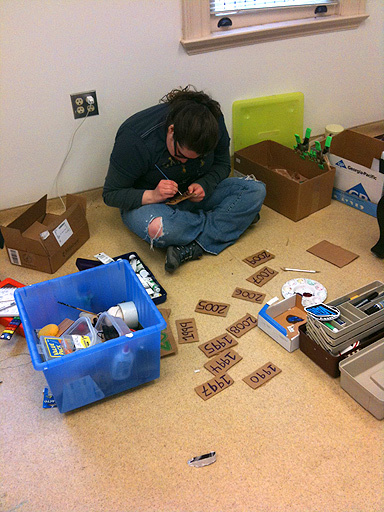 The top floor has quick access to the basement to fabricate hardware or physical elements of a project that is both digital and physical or sculptural. 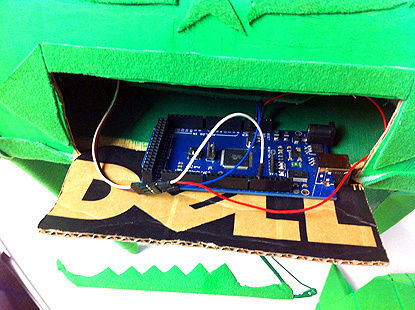 Some devices use hardware such as sensors or robotic elements and the Gatehouse provides an all in one space allowing students to develop the structural part and then come upstairs and reprogram it or test it. 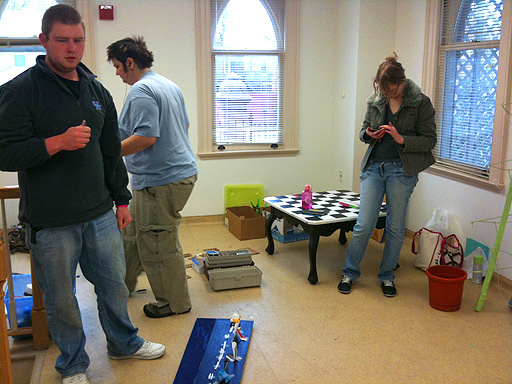 <<< To the left you will see images of students working on an experimental installation project in Professor Michelle McAuliffe's Studies in Graphic Design class meeting in the Gatehouse. 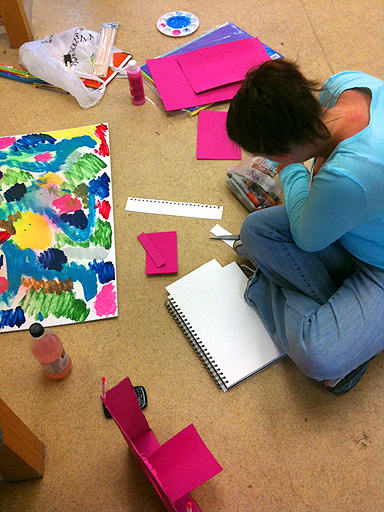 Students are using raw materials and found objects to create spatial communicative experiences using Type, iconography, color, objects, and space. 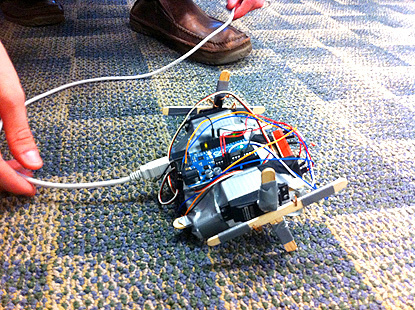 \/\/\/\/ Below you will find photos of students working on their Arduinimal Projects, kinetic projects custom fabricated and coded with the Arduino microcontroller, servo motors, light sensors, distance sensors, and more. 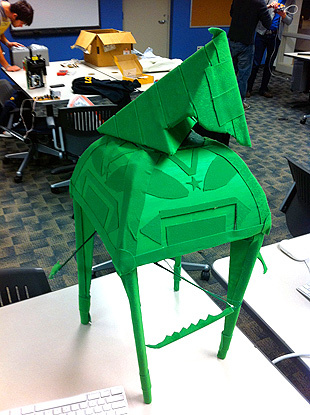 Arduinimal's are animals that don't presently yet exist in the world (Theor Jansen's Strandbeasts), and the students are required to develop everything from where the Arduinimal originates to the psychology behind why they behave and interact the way they do. 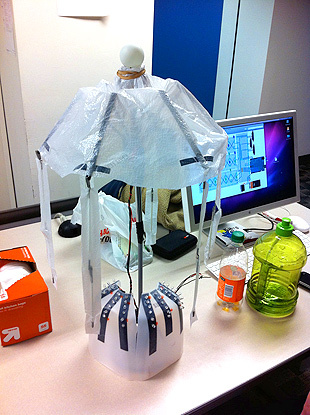 Students will be sharing their completed Arduinimal projects at the Skinny Tuesday event on April 5th.